DATE/TIME:	January 31, 2019 / 8:25 p.m.
On Thursday, January 31, 2019 at 8:25 p.m. deputies from the Yucaipa Police Department responded to a report of a vehicle crashed into a pole. 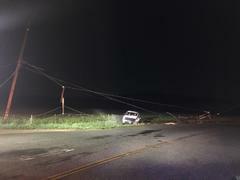 The investigation showed Jordan Newman was driving his vehicle east on Outer Highway 10 when it left the roadway and collided with a Southern California Edison (SCE) power pole. 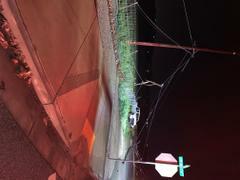 Newman was not injured in the collision, but was trapped because live electrical lines fell onto his vehicle. The collision sheared off one power pole, causing other poles to be pulled down or damaged. SCE and fire responded to the scene. SCE personnel shut down the power so Newman could safely exit his vehicle. Outer Highway 10 from Live Oak Canyon Road to 16th Street was expected to be closed until at least 8 a.m. on Friday, February 1, 2019, while SCE works to restore electrical service and complete repairs. At the conclusion of the investigation, Newman was arrested for driving under the influence of alcohol and booked into Central Detention Center.